The Resolution by the General Assembly of the United Nations on November 10, equating Zionism and racism, has provoked a torrent of response in the news media. Much of this response has been deliberately deceptive, and there consequently exists a state of confusion in the average citizen’s mind as to just what Zionism is and what its relationship is, if any, with racism. 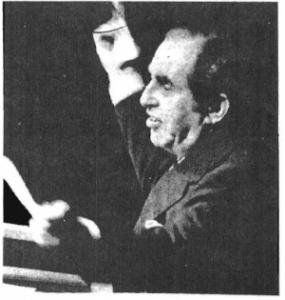 Israeli Ambassador to the UN, Chaim Herzog, sneers at “goyim” in the UN General Assembly as he contemptuously tears up their resolution condemning Zionism. It is arrogant behavior like this which has earned the Jews the well-deserved hatred of all the other peoples of the world. The Jews are essentially correct in asserting that one cannot be against Zionism without also being against Jews. Even though many Jews do not participate actively in any of the numerous Zionist political organizations, it is an undeniable fact that Jews, non-religious as well as religious ones, are nearly unanimous in their support for the government of Israel and for the political goals of Zionism. But is Zionism equivalent to racism? Jews are the very image of wounded innocence as they hotly deny this. They correctly point out that Jews have been the instigators, the financiers, the propagandists, the generals, and, to a great extent, the soldiers in the war against racism, both in the United States and in other parts of the world. As just one example, the most important organization in America seeking to bring about racial mixing between Blacks and Whites, the National Association far the Advancement of Colored People, has been an almost exclusively Jewish enterprise from its founding by Jews in 1910 until the death of its last Jewish president, Kivie Kaplan, last year. 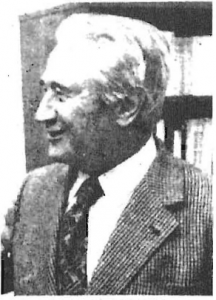 A Jewish lawyer, Jack Greenberg, still heads the NAACP Legal Defense Fund, which has instigated most of the moves toward court-enforced racial mixing in the last 25 years, including the original school-integration decision by the Supreme Court in 1954, from which all of today’s forced-busing orders have stemmed. And the record of votes by Jewish legislators in the Congress and statements by Jewish spokesmen in the media is clear: they overwhelmingly favor all moves, including the racial busing of school children, which bring about increased racial mixing. In other countries it is the same story. In South Africa, for example, the crumbling of the government’s policy of apartheid and the decision to abandon Rhodesia are the direct result of Jewish pressure. Harry Oppenheimer, the Jewish multibillionaire who controls the De Beers diamond mines, practically all of South Africa’s gold mines, her uranium industry, and a dozen other South African industries as well, has used his enormous wealth to buy control of many of the English-language news media in South Africa and has made substantial inroads into Afrikaans newspapers and magazines. He uses his media control to propagandize for Black-White “equality” and eventual Black rule for South Africa while simultaneously applying more direct pressures to government officials. He is supported in his efforts by South Africa’s very substantial Jewish community. So, if nearly all Jews are Zionists and if nearly all Jews believe in racial mixing, how can Zionism be a form of racism? Assimilation is common treason against the banner and ideals of the Jewish people… But one can never ‘become’ a member of a natural group, such as a family, a tribe, or a nation. One may attain the rights or privileges of citizenship with a foreign nation, but cannot appropriate for himself its nationality too. To be sure, the emancipated Jew in France calls himself a Frenchman of Jewish faith. Would that mean, however, that he became a part of the French nation, confessing to the Jewish faith? Not at all. Because in order to be a member of the French nation one must be a Frenchman by birth, one must be able to trace his genealogy back to the Gauls, or to another race in close kinship with them, and finally one must also possess those characteristics which are the result of the historic evolution of the French nation. A Jew, on the other hand, even if he happened to be born in France and still lives there, in spite of all these, he remains a member of the Jewish nation, and whether he likes it or not, whether he is aware or unaware of it, he bears the seal of the historic evolution of the Jewish nation. 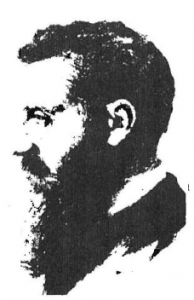 All three Zionists quoted above may be correctly regarded as racists, in that they reject the prevailing notion of the day that only the individual has any real significance and that it is wicked even to take into consideration the biological and cultural connections of the individual to a “natural group” (to use Dubnow ‘s term) of which he is a member. It can be argued, nevertheless, that Jewish racism is at least a little different from the racism of most other peoples, in that it does place relatively less emphasis on purely biological connections and relatively more on other tribal connections: a shared culture, history, and attitude toward the non-Jewish world. But this is to be expected in a people who exhibit as much biological diversity as the Jews do. They have absorbed physical traits from many of the other races among whom they have lived, until today, although most Jews still have many racial factors in common, they cannot be easily classified as a distinct race — and certainly not as a homogeneous race. That which defines the Jews is only partly racial. They are also a partly national, partly religious, partly historical, partly cultural entity. Indeed, because Jews are much more uniform psychically than physically, it is very difficult to decide whether they are more nearly a racial entity or a cultural entity. But that may be an irrelevant point. The fact is that Jews, now and always, have regarded themselves as a distinct, separate, and very special category of people — the “chosen people,” the “people of God,” and, as such, superior to all other peoples of the earth. Nahum Goldmann, top Zionist leader. He speaks openly of a “Jewish race” and urges Jews everywhere to be loyal only to Israel. Judaism can have nothing in common with Germanism, if we go by the standards of race, history, and culture, and the Germans have the right to prevent the Jews from intruding into the affairs or their volk… The same demand I raise for the Jewish volk, as against the German… The Jews are divided into two categories, those who admit that they belong to a race distinguished by a history thousands of years old, and those who don’t. The latter are open to the charge of dishonesty. If the racism expressed by Goldmann in the above statements were all there is to it, it would be hard to find fault with Zionism. Racism — the feeling of belonging to a “natural group,” of owing loyalty to that group, of wanting to preserve its identity and promote its welfare, of preferring to associate with members of that group rather than with aliens — is a universal, natural, and healthy condition of mankind. Indeed, it is a natural condition of all living things, in a sense, and they all owe their very existence to its universality. But Zionism — whether one prefers to call it Jewish nationalism or Jewish racism — goes far beyond that. It is a distorted racism, a perverted and predominantly negative racism, expressing itself more in hostility toward other peoples than in positive aspirations for the Jewish people. And, more than 3,000 years later, the Haganah and the Irgun and the Stern Gang massacred the entire populations of Palestinian villages in order to terrify the other Arab inhabitants of Palestine into fleeing the country and leaving their homes and farms and businesses to be taken over by Jews. This hostility toward other peoples, this extreme Jewish xenophobia and ethnocentricity, this contempt for everything not Jewish is revealed over and over again in the writings of Zionists, just as in their actions. It is a masochistic sort of racism, which glories and revels in the anti-Jewish hostility which it in turn provokes. 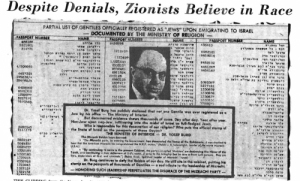 This clipping from the November 21, 1975, issue of the Jewish Press, which claims to have the largest circulation of any English-language weekly newspaper for Jews, complains that Gentiles are “infiltrating” into Israel posing as Jews, thus “desecrating” the Jewish state and religion. In the eyes of orthodox Jews, “goyim” (Gentiles) are mere cattle, not human beings. Every nation in whose midst Jews live is, either covertly or openly, anti-Semitic… Anti-Semitism increases day by day and hour by hour among the Gentiles… We are one people — our enemies have made us one in our despite… Distress binds us together, and, thus united, we suddenly discover our strength. Such unbridled and reckless arrogance, stemming from the persistent Jewish notion that the children of Israel have been “chosen” to rule the world and must, therefore, remain aloof from the goyim, destined to be their slaves when the Messiah comes, has led to a great deal of friction between the Jews and their Gentile hosts throughout the ages. And yet even this negative and peculiarly Jewish form of racism could be tolerated, if that were all. The Jews could all go off to the Middle East and finish butchering the Palestinians, or they could all settle on a large island by themselves somewhere, and they could then indulge their narcissist fantasies and their hatred of the rest of mankind to their hearts’ content, and we would not care. But gathering the Jews of the world together in one place is not really part of the Zionist scheme. They want an exclusively Jewish homeland, all right, but they also want to maintain their death grip on the economies and the governments of the Gentile lands where they live as minorities. Zionism is built not only on the ideas of Jewish exclusiveness and Jewish superiority, but also on the idea of Jewish world dominion. Not a world dominion achieved by force of Jewish arms or by any frontal assault on the hated goyische world, but a dominion brought about by infiltration and subversion, by the encouragement of weakness and decadence among the Gentiles, by the imperceptibly slow injection of a Jewish spiritual poison into the hearts and minds of the goyim, destroying their will to resist. And therein we have the explanation of the seeming dilemma: Jews who have devoted all their talents and energies to combatting racism being themselves charged with racism by the world community. Yes, Jews are against racism — racism among the Gentiles, that is, because they want to destroy the unity of the Gentile nations. And, yes, Jews (or Zionists, if you prefer) are racists, because they, more than any other people, realize the necessity of maintaining their own unity. The condemnation by the United Nations of Zionism is, on the whole, a welcome move, but it nevertheless fails to face the issue as squarely as it should. The UN has condemned the Jews for their behavior in Palestine, for practicing both physical and cultural genocide against the Palestinian people. But that is only a negative form of the same racism which is practiced by all healthy peoples. What the Jews are doing to the Palestinians is what the Turks did to the Armenians, what the Serbs did to the Croats, what the American pioneers did to the Indians, what the Germans did to the Jews (although hardly to the tune of 6,000,000 as the Jews claim). It is the way of the world, even if, in our Western squeamishness, we would like to see more positive and fewer negative expressions of this natural and universal racism. And so, in this regard, the Jews are at least justified in their claim that the UN condemnation of Zionist racism is hypocritical, because most of the members of the UN practice their own forms of racism. But if the UN were really an honest organization, it could have issued a denunciation of Zionism against which the Jews would have no defense. Theodor Herzl, one of the “founding fathers” of Israel. He dreamed of an all-Jewish state from which the Gentile world would be ruled, in fulfillment of Jewish “prophecies. The UN could have pointed out that Jewish racism is a unique evil — a unique danger to the world — not because the Jews want Palestine all to themselves or even because they aspire to world rule, but because of the truly unique ways in which the Jews go about implementing their Zionist designs. Recognizing more clearly than any other people the importance of racism as a natural defense — as Nature’s way of maintaining racial integrity — the Jews deliberately go about neutralizing the racism of their intended victims, thus destroying their unity, their cohesiveness, and their will to resist. It is a tactic which has proven extraordinarily effective in the past, a tactic to which the Western peoples in particular have proven susceptible. It is for this reason that the Germans, the one nation in modern times which developed a defense against Jewish racism, named the Jews “der Weltfeind” — the world enemy.